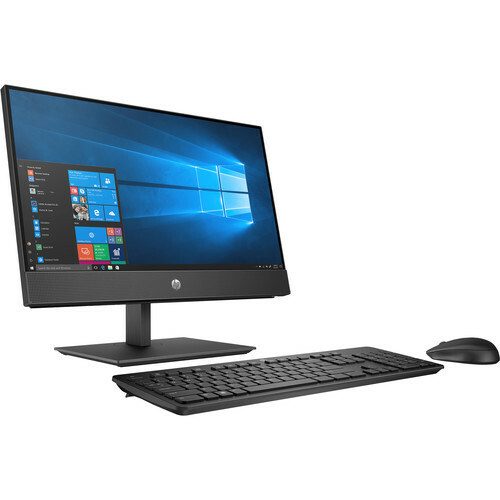 The HP 21.5" ProOne 600 G4 All-in-One Desktop Computer features an in-plane switching (IPS) panel for wide viewing angles. Furthermore, driven by integrated Intel UHD Graphics 630, the screen has a Full HD 1920 x 1080 resolution and a 16:9 aspect ratio. A DisplayPort 1.2 output on the back of the system provides you the option to connect an external display. The system is powered by a 3.0 GHz Intel Core i5-8500 Six-Core processor, plus 4GB of 2666 MHz DDR4 RAM that allows you to efficiently multitask as well as quickly access frequently used files and programs. Furthermore, the RAM can be expanded up to a max of 32GB using one 16GB module in each of the two SO-DIMM slots. For storage, it has a 500GB 7200 rpm HDD for all your data and media content, plus an empty M.2 slot for additional internal storage. Should you need more, you can connect external storage options, keyboards, mice, and USB devices via its four USB 3.1 Gen 1 Type-A ports, and a USB 2.0 Type-C port. Connect to the internet using 802.11ac Dual-Band Wi-Fi or the Gigabit Ethernet jack for a stable and reliable wired connection. Other integrated features include a 720p webcam, a digital microphone, 2W stereo speakers, an HP 9.5 mm slim DVD optical drive, an SD media card reader, and a 3.5mm microphone/headphone combo jack. Once set up, you can use its adjustable height stand to fit your viewing preference. Included is an adjustable height stand, HP's USB Business Slim Keyboard, HP's USB Optical Mouse, recovery media, and a power cord. Windows 10 includes all of the features of Windows 10 Home plus many designed specifically for businesses users, including Hyper-V virtualization, BitLocker disk encryption, and remote desktop access. Devices will also be able to join domains and the Azure Active Directory, and they can even access a specialized version of the Windows Store featuring custom, company-specific applications. Box Dimensions (LxWxH) 34.0 x 18.25 x 9.5"